Despite being the country’s economic hub and capital city, Ottawa enjoys being labeled as the least expensive to live in among other big Canadian cities. Ottawa is the 4th cleanest among 300 major cities in the world, and its perimeters are edged by 532-square kilometers of parklands, forests, and wetlands. With 883,391 people with expats making up 23% of the population, it also happens to have the lowest crime rate in the country. Rent for an apartment in the city center costs around USD$925 while renting an apartment outside of the city center would cost around USD$675. Monthly rent for 1 bedroom flatcar with attached bathroom costs C$ 800 – 490 while monthly rent for 2 bedrooms furnished flat costs C$ 2700 – 1199. Monthly rent for 3 bedrooms furnished flat will cost C$ 2950 – 1600. Property price per square meter is approximately 2,280 USD. A wide selection of restaurants, both high and low-end varieties, are available throughout the city. A popular destination for those in search of an ethnic dining experience is the Byward Market, which offers a multitude of dishes for the multi-cultural palate. Along Somerset Avenue, check out Ottawa's own Chinatown, while the city's Little Italy is along Preston Street. Coffee shops like Starbucks are also scattered throughout the city center, while the mainstream coffee nook Tim Horton's can be found on almost every street corner. For those who want a grand dinner now and then, budget is around USD$145 for one person. 1 Daily menu in business district costs C$16 while a dinner out for two in Italian restaurant with wine and dessert costs C$80. 1 Big Mac Meal costs C$8 – 9. The city has a score of fine-dining restaurants you can choose from. One, known as Domus, located on Byward Market, is an award-winning restaurant serving Canadian cuisine. A mid-range meal for two, on the other hand, is also very much affordable at USD$44. Great mid-range restaurants can also be found on Elgin Street and most suburban shopping areas. Food such as a dozen eggs costs around USD 1.92, a litre of milk around USD$1 and a loaf of fresh bread costs about USD 1.67. 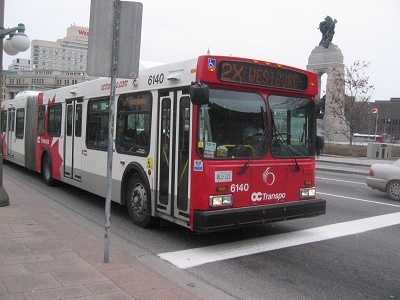 The city's transport system is managed by OC Transpo, which includes the bus and rail transit system. Bus fare is around C$3.25 - 3.50for each ticket. These tickets are available in local stores and are often sold in sheets of six. A day pass could also be purchased and used on both buses and trains. This costs about 7.50. Monthly passes cost around C97 per month for adults and are available at a lower rate for students and senior citizens. The city's train system is another common means of getting around Ottawa. The O-Train operates on a POP (Proof of Payment) system which accepts either the day pass or a ticket bought from automated ticket vending machine found around the train stations. A ticket costs about 2.75. Taxis are another comfortable and convenient means of commute. Many cabs can be found downtown, or you can also phone for one to pick you up. The base charge for cabs is about 2.45. Basic utilities such as phone service cost around 30-40USD per month for an entire household; Internet services cost about the same. You can come up with a long list of reasons why moving to Ottawa is a great idea. But it all boils down to the affordable cost of living in Ottawa that can be rewarding, especially for expats with family.